Chorispora tenella is also known as musk mustard, purple mustard, and cross flower. Chorispora tenella is commonly called musk mustard, blue mustard, purple mustard, and cross flower (after the cross formed by its four, pale purple petals). I like the name musk mustard, because the foliage has an earthy, musky flavor, which my pal Butter Wilde describes as mushroomy. I agree: the taste is a combination of mushrooms and horseradish. It’s also a tender, succulent plant with excellent flavor and texture. There are very few greens tasty enough to make an entire salad out of; musk mustard is one of those greens. Lightly dressed with a drizzle of oil & vinegar and a few crumbles of goat cheese…it’s the perfect salad. If you listened to the National Park Service and cattle ranchers, you’d think musk mustard was a noxious weed. And you’d be missing out on an easy-to-identify, plentiful wild edible. Musk mustard can cover great swaths of ground, and if you’re a livestock farmer, you’d have reason to complain, since the consumption of musk mustard by cattle and goats is said to negatively affect the flavor of their milk. Not being a livestock farmer, I thrill to the sight of musk mustard, knowing how delicious this plant is. It grows best in full sun, dry conditions, and poor soil. Musk mustard is one of the first wild edible greens to emerge in spring. Look for it when you’re foraging for dandelions and dock. Basal foliage grows in a rosette, then plants branch as they grow, eventually reaching six to twelve inches in height. Musk mustard flowers come in shades of purple, and form a cross shape approximately 1/2 inch in diameter. The leaves of musk mustard are from two to four inches long and generally slim in shape. Lower leaves are attached to the plant with petioles (leaf stems) and may be deeply lobed, almost like dandelion foliage. Higher leaves are sessile (having no leaf stems) and clasp the main stem of the plant. The leaf margins of higher leaves range from wavy to notched. You may find a range of leaf shapes on a single plant. While the USDA lists musk mustard as present in all states west of the Mississippi (and a few eastern states) it is most common in dry, nutritionally poor soils. If you’re a forager who lives where it’s dry and the soils are nutritionally poor, you feel very happy indeed when you come across a generous patch of musk mustard. Musk mustard is an annual plant, which means it completes its life cycle, from seed to seed, in a single growing season. Pollinated flowers produce narrow seed pods. Seeds can be harvested when they’re dry and black, then used as a spice, or combined with vinegar to make a wild mustard. If you have access to a field of musk mustard, harvest to your heart’s content. Snip the top four to six inches off each plant, including the flowers, which are not only edible, but also pretty. If you only find a few plants and want to encourage the patch to return next year, take a few leaves from each plant, and leave the flowers behind to be pollinated and ripen seed. The flavor of musk mustard is milder than that of most wild mustards. It can be combined with other greens in stir fries, or baked into wild greens pies. The flavor is stronger when used raw, which is how I prefer it. But if you like mild flavors, try cooking musk mustard. This reduces the horseradishy flavor of the green. If you’re not a salad person, try using musk mustard in dainty finger sandwiches. Roughly chop 1/2 cup of mustard leaves, then mash them with a Tablespoon of softened butter to bind the chopped leaves together. Spread a layer of the musk mustard butter on a thin piece of soft, white bread, then top with another thin piece of bread. Cut off the crusts and slice the sandwich into pieces about an inch wide. The sharp flavor of the green goes wonderfully with creamy butter. Musk mustard can be harvested year ’round if you live somewhere where there isn’t much snow. Winter foliage is slightly thicker than spring leaves, but is still very tasty. Try them in musk mustard tempura! The next time you’re driving down the road in spring and you spot a carpet of light purple flowers extending as far as the eye can see, pull over. It’s time to harvest musk mustard. Hi! I finally ID’d this ubiquitous plant growing everywhere here! I have yet to take a taste. I’m curious what the nutrient content is. Hi Christina, I’m sorry I don’t have any nutritional info for you. It’s hard to come by with foraged foods, although John Kallas includes some in his excellent book Edible Wild Plants. Where do you live? I ask because I’d never seen this plant before I moved to NM from NYC. I think it’s more common in the west. It should be great with turkey! I’m letting some seed pods ripen and I’ll try making some mustard with it. 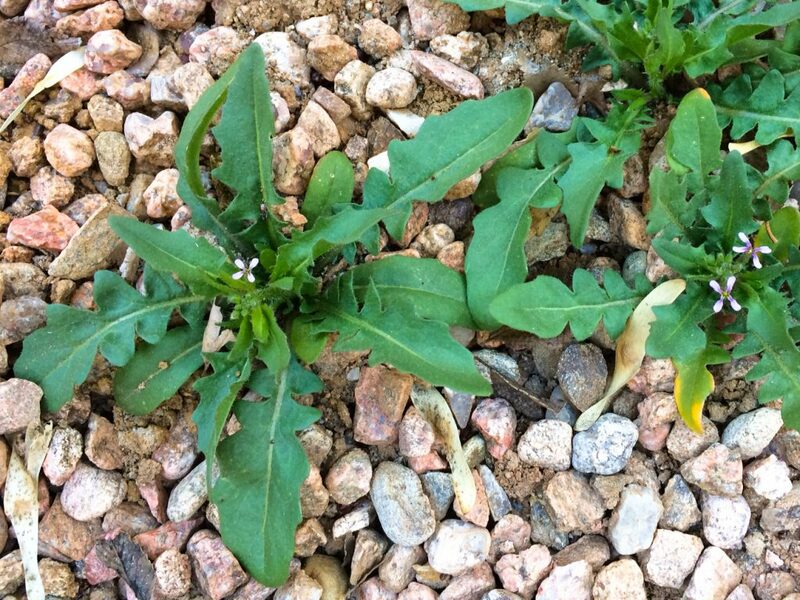 It’s growing profusely in our yard, and your site helped us identify it with confidence. We are going to have some in our dinner salad. They taste like radishes to us, and are actually quite good. We are in Western Colorado about 5500 feet. That’s what I like to hear! Hope you enjoy your salad. I’m letting some of mine go to seed this year. I want to try making mustard from the seeds.